It’s all about Panda Power in this fantastic wacky slot game. The cute, little sneezing balls of madness are back, and they are in this all-new slots format game. A 3-reel by a single pay-line slot that has a hint of an Asian theme that we tend to see so often in slot games, however, this isn’t your typical Asian themed game as our miniature panda friends are the sole focal point. Play casino slots online now! Of course, their forever mischievous ways will be in full flow so don’t be afraid to embrace this as you swing down into the bamboo jungle and join in with them as you spin to win in this wacky adventure that will have you gripped and coming back for more, for those of you who like Panda’s (I mean come on who doesn’t) this game will be right up your street. Obviously, this is a Microgaming creation, which you probably had already guessed. They have come up trumps once again with this one by creating a successful online slot to add to their numerous legendary finished articles. 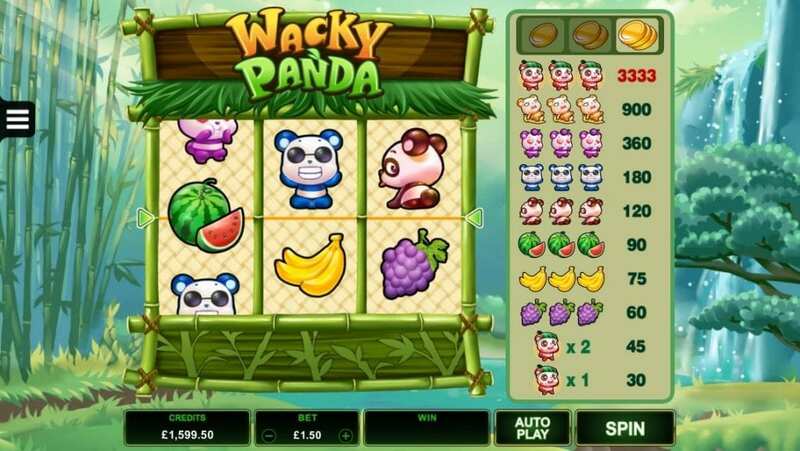 Wacky Panda has that unique cutting edge that when you play the game you can just feel it’s the Microgaming software that’s responsible. Microgaming aren’t record breakers for anything, their team consistently produce high-quality games that fit the same bracket as Wacky Panda. Well established games such as Mega Moolah would be an example of far too many to name. Wizard can provide you with more games by this developer. For those of you who are looking for a simple yet enthralling slot game that is full of energy and action packed to the brim or spin I should say, then you really don’t need to look too much further because this is an easy 3-reel by single pay-line will give you that straightforward gaming experience that so many of us crave from time to time. This game gives you a truly different experience with a shed load of ways for players to win leaving you feeling fruitful. Let's find out more from our helpful guide in playing the best slots. There are many different symbols in Wacky Panda and they all represent unique numerical values that depend on the actual symbol. 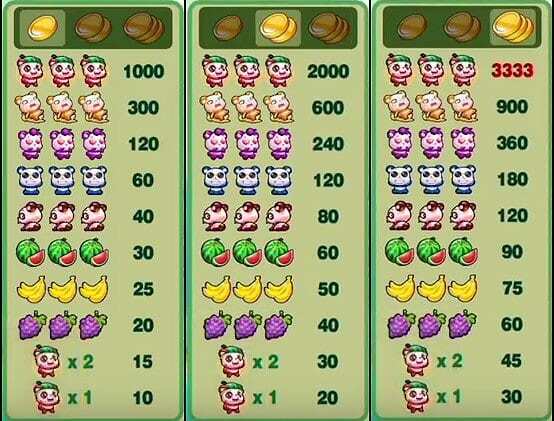 So, the symbols represent as follows; Red Pandas – 30 credits, Grapes – 60 credits, Banana’s – 75 credits and Watermelons a whopping 90! It’s totally up to you for how much you decide to stake for each spin but the highest payout for this game is 3,333 credits but for you to win this massive prize you must match a full row of the red pandas. So be sure to watch out for that!